Despite being an artist born and based in Japan, Takashi Murakami has preferred to focus on showing his work to an audience outside of his home country. In fact, it is more likely to find his pieces on display in Paris’ Galerie Perrotin or some New York-based gallery rather than in his hometown of Tokyo. Even 2001’s Superflat group exhibition, which he curated and named his aesthetic after, debuted at The Museum of Contemporary Art, Los Angeles and only traveled within the United States. The truth is that following his Summon monsters? open the door? heal? or die? exhibit at The Museum of Contemporary Art Tokyo in 2001, it would be fourteen years before his homeland had another major solo exhibition. But when he did return, it was with something truly awe-inspiring. Having opened on October 31st, 2015 at the Mori Art Museum in Tokyo, The 500 Arhats included forty new paintings and sculptures from the artist on display, though the high-profile aspect was certainly the 100-meter wide painting cycle that the showcase took its name from. The inspiration for Murakami’s painting came from the legend of the 500 arhats, holy people who remain in this world to spread the teachings of the Buddha. With the belief in arhats most likely having been introduced into Japan during the Heian period, it appeared to flourish on a national scale in the Edo period, when works depicting these enlightened disciples on canvas and as sculptures began being produced around the country, though the concept has changed over the centuries with variances between different schools and regions. For his interpretation, Murakami was primarily inspired by two painters, Nagasawa Rosetsu and Kanō Kazunobu. Murakami had long admired 18th-century painter Rosetsu’s rendition, wherein the Edo period artist depicted all 500 disciples of Sakyamuni Buddha on a roughly 1¼-inch square canvas, and this appropriately called “true wonder” was previously the basis for a 2011 piece by Murakami, Study of Nagasawa Rosetsu’s “Five Hundred Arhats,” Included in Hosun, which was reduced to the same size as Rosetsu’s original with the help of Ishii Gakujoh. Kazunobu’s Five Hundred Arhats, on the other hand, is a massive work that the artist entirely devoted himself to, creating 100 hanging scrolls in the series between 1854 and 1863, the year of his death. And shifting from Rosetsu’s microscopic scale to Kazunobu’s monumental one, Murakami’s The 500 Arhats is one of the largest paintings ever produced. Murakami’s The 500 Arhats consists of four roughly 9⅞-foot tall and 82-foot long sections, each devoted to a different natural element — wind, forest, fire, and mountain — and each named after the Chinese constellation creature presiding therein: the Blue Dragon in the east, the White Tiger in the west, the Vermilion Bird in the south, and the Black Tortoise in the north. Conceived as a response to the 2011 Tōhoku earthquake and tsunami, this acrylic painting on canvas work is a homage to the power of nature. Having begun work on it in March 2011, Murakami needed to renovate his massive studio space to accommodate the size of the work’s sections. Recruiting over 200 art university students from across Japan, this staff comprised of research teams that compiled inspiration material for the artist as well as assistants that aided in the execution of Murakami’s vision, specifically the application of the 4000 silk screens this painting required. First displayed as part of 2012’s Ego exhibition at the Qatar Museums, as a token of gratitude to Qatar for promptly coming to the aid of Japan in the wake of the earthquake and tsunami, the exhibition at the Mori Art Museum was no less of a spectacle, one which was accompanied by a multitude of memorabilia. To commemorate the Takashi Murakami: The 500 Arhats exhibition at the Mori Art Museum, a gift shop was set up within the gallery that offered t-shirts, playing cards, magnets, and other objects imprinted with imagery from Murakami’s painting. And one of the limited edition products available exclusively at the venue was a series of netsuke-style miniature figurines, each one randomly packaged in a plastic bubble like those commonly associated in Japan with gashapon capsule toy vending machines. 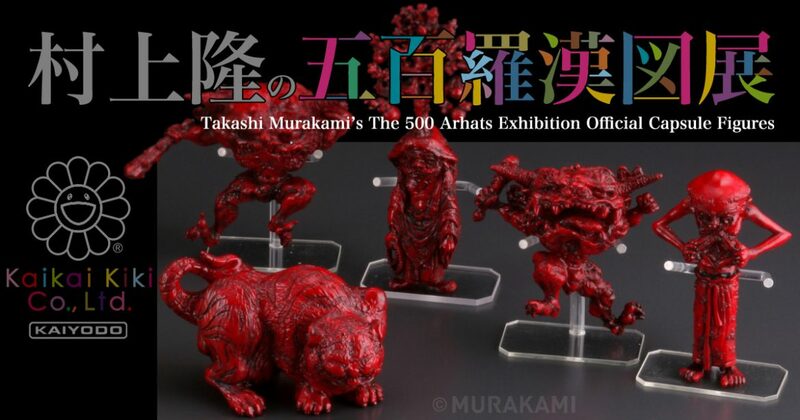 Finished in faux ivory and red renditions, as well as a complete set of five figures in golden coloration, the series interpreted two arhats and three supernatural beasts from Murakami’s painting sculpturally. Of the arhats represented, Rāhula (羅睺羅) was the only son of Gautama Buddha and his wife Princess Yasodharā. Depicted stretching open his stomach to reveal a Buddharūpa inside, this is perhaps a visual reference to the spiritual Enlightenment his father imparted upon him, making him an owner of a transcendental inheritance. The other enlightened disciple in this capsule figure collection is Woody Arhat (樹木羅漢), a Buddhist monk that grew the Tree of Life from his head while practicing the meditative discipline of zazen. A timeless symbol of mankind’s interconnectedness to the natural world, one which Murakami revisited in 2013’s Deer God of the Forest and Arhat painting, this recalls not only how Buddha was said to redeem the whole universe under the protective branches of the Bodhi tree but also the powerful imagery of the Buddharūpa head entwined within the roots of a tree as seen in Thailand’s Wat Mahathat. As previously mentioned, the White Tiger (白虎) is one of the four creatures of the Chinese constellations, this king of the beasts coloration supposedly shifting in coloration when it turns 500 years old. And, according to legend, this mythological animal only appears when the emperor rules with absolute virtue, or if there is peace throughout the world. The final two sculptural designs take a cue from the arihants of Jainism, some of who are spiritual guides to help mankind towards the path to salvation while others are concerned strictly with their own liberation, as the Red Ogre (赤鬼) is consumed by greed and the Blue Ogre (青鬼) is lost to anger. Modeled after the traditional Japanese “demons” of folklore, known as oni, their inclusion in this special capsule collection emphasizes the breadth and uniqueness of Murakami’s vision, not only depicting those that “save people by eliminating earthly desires” but also those lost to emotion that “destroys not only one’s surroundings but also yourself”.